As always, PAX was amazing. I ate Piroshkies for breakfast each day, had a wonderful walk through Seattle each morning, gamed all day, and then broke bread with lovely people each evening. I also imbibed the occasional adult beverage. We had another interesting and wonderful year this year, and I had the opportunity to play some amazing games with some amazing friends. In recent years, our group has come to realize that we don’t go to PAX to see the games anymore. We go to see each other. Don’t get me wrong; the games are great, but this year my greatest memories from PAX came from the time that I shared with my friends. With that in mind, it’s very possible that we will not be attending PAX in the coming years. The hustle to get the tickets is crazy (they sold out in 6 hours last year), and the possibility that some of our group not attending is just becoming too great. The game demo that I liked the most this year was The Cave. Ron Gilbert really tapped into my Maniac Mansion nostalgia. The best part of this puzzle game was the intuitive nature of the puzzles. That is, you didn’t have to have to go through a process of random trial and error to get to your solutions; you just had to think about them for a little while. I also found the demo for X-Com to be very nice. X-Com’s approach to returning to the old game seems very intense, but it also seems much more linear. I couldn’t tell if that was just a consequence of the “training” nature of the demo, or if the whole game plays like that, but for now I have to remain cautiously optimistic. Smite, on the other hand, is much easier to judge: it’s terrible. If you replaced one of the letters of its name with an “h,” you would have a much more apt description; I’ll let you figure out which out. I suppose there are MOBA players out there who are going to disagree with me, but I just can’t get into that kind of game. My biggest beef with the game had to do with the down time. I noticed, after a while, that each time my character died, the time delay for respawning got longer and longer. So I have to wait a long time, then run across the field in (what feels like) slow motion, only to die and have to wait an even longer time. I tapped out at about the point when my respawn time was 53 seconds; as I stood, I saw that the guy beside me had over 80 seconds remaining. I’ve come to accept that I simply don’t understand the players that find this fun; Not only does this discourage experimentation, but it punishes you AND makes it harder and harder to figure out what you could have done differently. In any case, I didn’t waste much time on unfun games. If I were asked my “Game of the Show,” I would probably have to say it was The Cave. This game was pure Ron Gilbert goodness, wrapped up in a beautiful environment. If I ever saw a spiritual successor to Maniac Mansion, The Cave is definitely it. 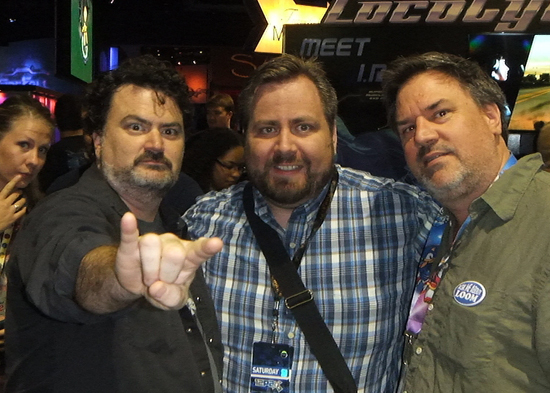 Tim Schafer and Ron Gilbert graciously took the time to take a picture with me at the Double-Fine booth, and that was certainly a highlight of the show. I’ll write more about the convention experience in the weeks to come.